A female black Rhino stands in a box before being transported during rhino translocation exercise In the Nairobi National Park, Kenya, June 26, 2018. Ministry of Tourism and Wildlife said July 18, 2018, that a ninth black rhino has died after being relocated to a new sanctuary in a national park. Kenya’s Ministry of Tourism and Wildlife said Tuesday that a ninth black rhino has died after being relocated to a new sanctuary in a national park. The ministry says preliminary investigations indicate the rhinos died of salt poisoning after drinking water with high salinity. The latest black rhino death, reported Tuesday, brings the number of deaths in the botched relocation operation to nine. Only two of the transplanted black rhinos remain in the new habitat at Tsavo East National Park. The Kenya Wildlife Service says the relocation was meant to establish a viable population in the new sanctuary and to safeguard the endangered species from poaching. A team led by Kenya’s police investigative unit will look into exactly what caused the deaths and how it happened, and give a report in a week's time. Najib Balala is Kenya’s cabinet secretary for tourism and wildlife. “And the team that is going to lead the investigation will be a senior officer from the CID Office, the criminal investigation office, then we will attach somebody from my office. There will be the University of Nairobi, the Vet Department, there will be the Vet Department also at the ministry of agriculture,” he said. 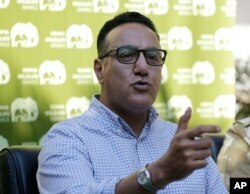 Cabinet Secretary for Tourism Najib Balala speaks to journalists in Nairobi, Kenya, July 17, 2018, after he visited the Tsavo east national park, after the death of eight black rhinos which were moved to Tsavo East National Park. Balala said the deaths were unprecedented in KWS operations, necessitating both external and independent investigations. The secretary showed photos of Rhino horns he said belonged to the deceased animals to confirm that all the horns were secured by KWS after their death. Earlier, Kenyans on social media had voiced suspicion the rhinos were killed for their horns, which are coveted in Asia as status symbols for their mythical healing qualities. Balala said the two remaining rhinos in the park are being monitored closely. “We have confirmed this morning with park management that they are in good health,” he said. Rhino populations across Africa have dropped dramatically in recent years, mainly due to poachers. According to the Kenya Wildlife Service, Kenya had a rhino population of 1,258 as of 2017. This figure included 745 black rhinos.